When Doctor Who first appeared out of a foggy London night in November 1963, no one knew what to make of the low-budget, serialized science-fiction drama about a citizen of the universe "and a gentleman to boot," who travels through time, solving existential problems. As David Tennant explained in last week's première episode of the 50th anniversary commemoration series Doctor Who Revisited, the original Doctor was played by then-59-year-old stage actor William Hartnell as "prickly, crusty, grumpy." Hartnell's Doctor was not at all the playful, carefree Doctor of later incarnations like Tom Baker, Christopher Eccleston and Tennant himself. Doctor Who Revisited will air for the next several weeks. Each three-hour episode focuses on a specific Doctor — tonight's second episode focuses on Patrick Troughton, with anecdotes from Tennant, Moffat and many of the surviving performers who acted with the Doctor in question, followed by an uncut, full-length repeat of what Moffat and the others consider to be that Doctor's most representative episode. It's all a prelude to Doctor Who's official 50th anniversary on Nov. 23, which will be commemorated by a special anniversary episode, The Day of the Doctor, featuring a reunion of Smith and Tennant, along with companions Coleman and Billie Piper and a one-time appearance by John Hurt, presumably as the Doctor's nemesis, The Master. The anniversary will also feature the première of a specially commissioned BBC film, An Adventure in Space and Time, a dramatized, behind-the-scenes account of how Doctor Who came into being, featuring Game of Thrones' notorious wedding host David Bradley as William Hartnell. The continuing survival of Doctor Who depended on the audience accepting another actor in the role. To get around the obvious continuity problem, Doctor Who's brain trust came up with the idea of "regeneration," in which, every several years, the Doctor dies and his spirit is revived in a new body. It was an absurd idea that hardly anyone believed would work, but Doctor Who has always traded in theatre of the absurd. Troughton, a stage actor known for playing character parts, played the Doctor for three seasons, until 1969, and reappeared in anniversary specials in 1973, 1983 and 1985. Original Doctor Who co-creator Sydney Newman envisioned Troughton's Doctor as a "cosmic hobo," a Chaplinesque figure who trotted through time and space, accepting whatever fate awaited him with cheerful resignation — radically different from Hartnell's acerbic take — but that was the point. Hardly anyone watching Doctor Who Revisited can fail to be taken by the sheer audacity of it all. TV is experiencing a new golden age in drama right now, but not even Game of Thrones or Orphan Black has the audacity to trade in reincarnation, and pretend it happens all the time. APA 6th ed. : Strachan, Alex (2013-10-19). Doctor Who devotees accept the absurd. Times Colonist p. C4. MLA 7th ed. : Strachan, Alex. 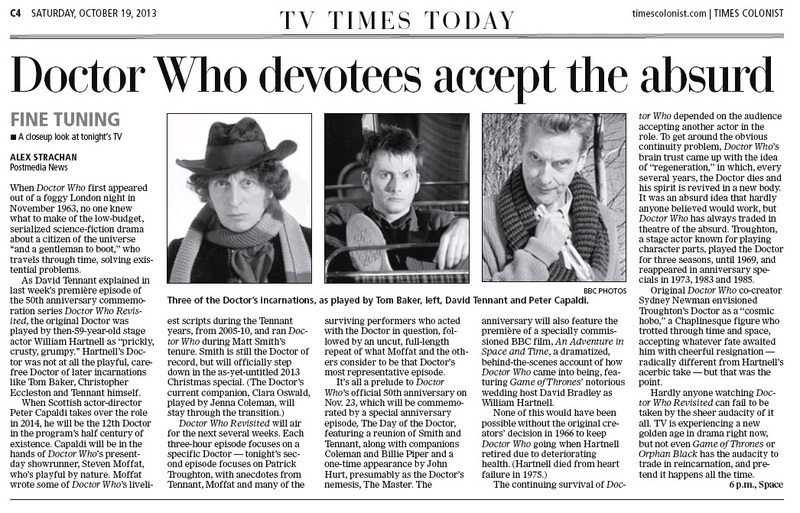 "Doctor Who devotees accept the absurd." Times Colonist [add city] 2013-10-19, C4. Print. Turabian: Strachan, Alex. "Doctor Who devotees accept the absurd." Times Colonist, 2013-10-19, section, C4 edition. This page was last modified on 20 January 2014, at 23:53.